Headache is a general term to describe any pain felt in the head, scalp or neck region, but not all headaches are alike. The International Headache Society developed a headache classification system for doctors to use as a diagnostic tool to help them determine the most effective course of treatment. In this system they classify tension-type headache as a primary headache disorder. Tension headaches are the most common type of headache, but also the least understood and hardest to treat. In trying to determine the cause of tension headaches, doctors formulate theories and one theory involves magnesium. Before taking magnesium supplements for any condition, consult your doctor. Tension headaches occur due to the contraction of the muscles in the neck and scalp. Although doctors cannot always determine the exact cause of your headache or what triggers the muscles to contract, they do understand the general mechanics involved. The Foundation for Better Health Care reports that tension headaches are related to migraine headaches. Both occur when electrical activity in the brain increases, causing a surge in the production of serotonin – a chemical in the brain needed to carry electrical impulses. The increase in serotonin causes the blood vessels to constrict. The serotonin then leaks out into the tissue surrounding the brain and when the blood vessels dilate the lack of serotonin irritates the nerves, causing your pain. Magnesium functions as an electrolyte, which means that it helps to balance the fluid level inside and outside of cells and carries electrical impulses between nerves and muscles. Your muscles contract and relax in response to nerve impulses that affect the level of calcium and magnesium. Magnesium remains in the fluid portion of muscle cells while calcium ions enter a small chamber in the cell known as the sarcoplasmic reticulum. When your nerves send electrical impulses to a muscle, it triggers the release of calcium into the fluid portion of the cell, which causes your muscle cell to contract. Magnesium ions generate an electrical charge that forces the calcium back into the tiny chamber, which allows your muscle cell to relax. A deficiency in magnesium disrupts this balance of ions and interferes with the ability of your muscle cell to relax, therefore contributing to your tight muscles in the head and neck that cause your tension headache. There's some evidence that suggests magnesium could help fight tension headaches. 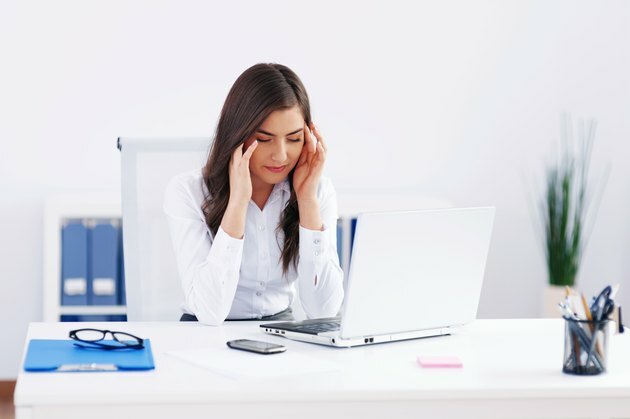 One study, published in "Medical Hypotheses" in 2001, notes that changes in magnesium levels in the brain can contribute to tension headaches, and taking magnesium salts -- magnesium supplements -- might prevent the headaches. An additional study, published in the June 2007 issue of "Neurological Sciences," reports that people who took magnesium supplements noticed a decrease in their headache symptoms, and the frequency of their headaches. However, this study has some design flaws and the results need further investigation. Although the theory associating magnesium levels to headaches is not yet proved, making sure you get enough magnesium in your diet reduces your risk for developing a magnesium deficiency and related symptoms. The Institute of Medicine sets the magnesium dietary reference intake at 420 milligrams per day for men over the age of 31 and 320 milligrams per day for women over that age. To meet this recommendation, eat a variety of green leafy vegetables, whole-grain foods, nuts, meat and milk. The Linus Pauling Institute reports that taking magnesium supplements reduces your risk for deficiency and may reduce the frequency of headaches, but only take the supplement under the supervision of your health care provider. Medical Hypotheses: Tension Headaches and Muscle Tension – Is there a Role for Magnesium?